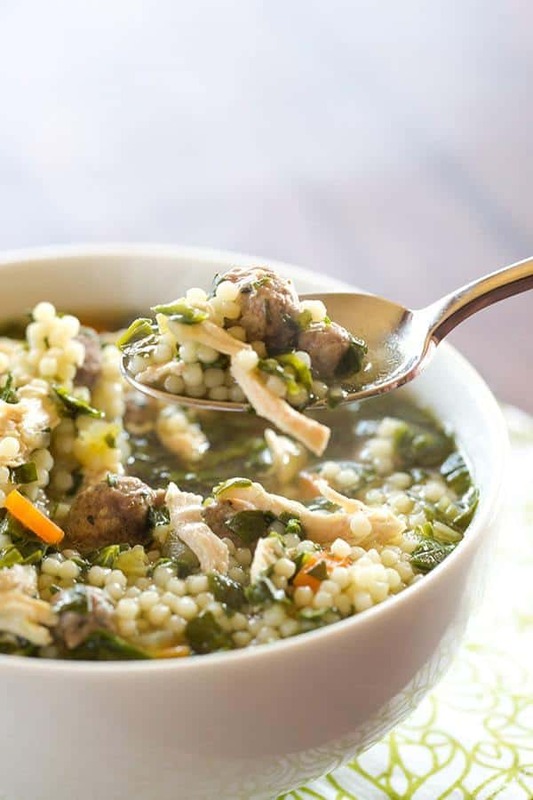 A classic Italian wedding soup recipe, with little bits of pasta, shredded chicken, spinach and of course those little meatballs! 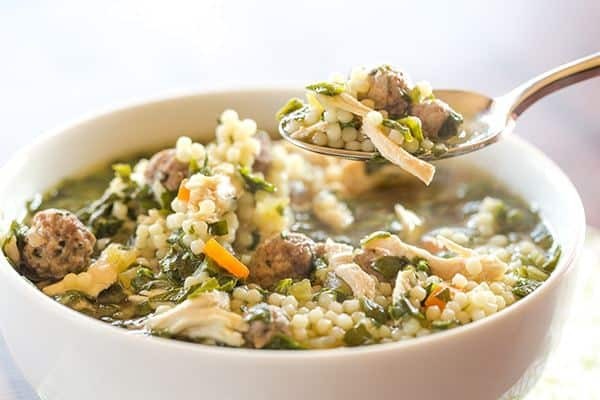 This wedding soup recipe is the very first one that I ever posted here on my little corner of the Internet. I grew up eating it at countless restaurants, at home and, of course, at weddings. My mom would make it occasionally, but it wasn’t until two summers ago that I fell in love with it again. 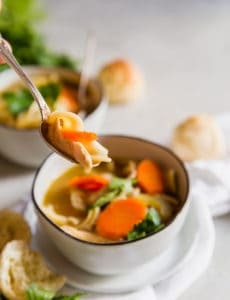 I’m usually not one to devour soup during the summer months, but I was going through the first trimester of my pregnancy, and spent many days not very interested in food at all. 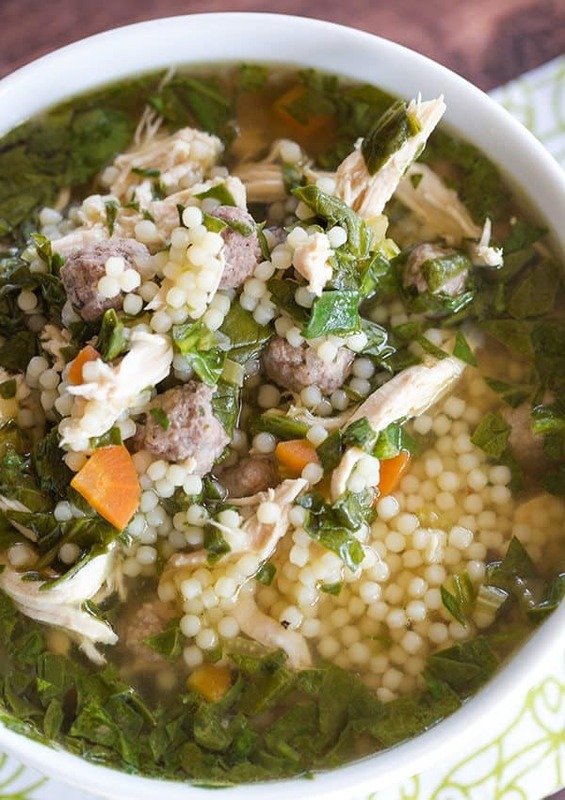 Every Sunday, my mom would deliver me a fresh pot of homemade wedding soup, and I ate it for nearly every meal throughout the week (with oyster crackers – a must!). It absolutely hit the spot. 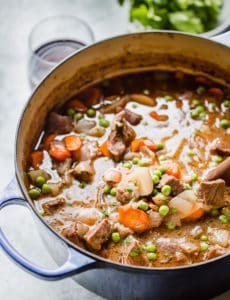 While the most basic wedding soups include some type of meat, a green vegetable, pasta and clear broth, I’ve always loved how wonderfully hearty my mom’s recipe is. Not only does she do the standard miniature meatballs, but she adds shredded chicken as well. I think it gives the soup so much more oomph and definitely makes it feel like more of a meal than just a bowl of soup. When I’m not feeling well, it’s this wedding soup, and not your typical chicken noodle soup, that soothes my soul and makes me feel better. Between the meatballs, chicken, little bits of pasta, carrots, celery and spinach, it’s extremely healthy, too! Combine all ingredients for the meatballs and shape into small (½-inch) balls. Place on a baking sheet, cover with plastic wrap and refrigerate for at least 1 hour. Meanwhile, place the chicken breasts in a large stockpot and fill with water until it is covering the chicken by at least one inch. Bring to a boil and cook until the chicken is completely cooked through, about 15 minutes. Turn off the heat and use tongs to remove the chicken to a large plate. Shred the chicken and set aside. Empty water from stockpot. Melt butter in the now-empty stockpot over medium heat. Add onion, celery, carrot and garlic, and cook until the vegetables are tender, about 10 minutes. Add the chicken broth and bring to a boil. Reduce heat to low, cover and simmer for approximately 30 minutes. Season to taste with salt and pepper. Gently add the meatballs to the soup and cook for 7 minutes. Add the pasta and cook for an additional 6 minutes. Add spinach and cook for an additional 3 minutes. Add the shredded chicken. Cover again and allow to simmer for another 30 minutes or so. You can eat as soon as the chicken is re-heated, but allowing it to simmer for a little longer allows all the new flavors to meld together. This recipe was originally published on February 11, 2007. Can you use ground turkey for meatballs? This is the perfect method for the meatballs and pasta to cook slowly. Turned out fabulous! Are we supposed to cook the acini first or just add it in uncooked? I finally found some in my area! My go to recipe. I use 3.5 pounds of lean ground beef and 1.5 pounds of pork or chicken sausage to make a couple hundred meatballs. Time consuming, but gives me enough to “food saver” for multiple pots of soup to be made quickly! Thank you so much for sharing and for making me look good! Came back because I forgot stars….want to leave 10! I made this soup for the first time a about a month ago and it was a HUGE SUCCESS. My brother and I loved it. It’s become a staple recipe that I make bi-weekly. It’s in our 2 week rotation. I can never find the acini di peppi, so instead I use Ditalini pasta because it’s small. 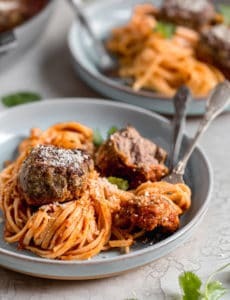 I don’t home make the meatballs because they never stay formed for me and I don’t know what I’m doing wrong so I use store bought ones. The only other difference I do is make my own chicken broth and I add a little bit of Italian seasoning. It is wonderful, hearty and just really great for soul. It’s also great because it’s warm and perfect for those cold nights. We love it! This soup is wonderful ! I made one small change. I simmered my chicken breasts in chicken stock rather than water. I then double strained & used the stock in addition to the broth (making a total of the required 12 cups). I hated to loose all of the chicken goodness in the water just to toss out. This was delicious. I did make a few changes, though. I like a heartier soup with less broth, so I cut the broth by 2 cups, added more veggies, and upped the pasta to 1 cup. My only frustration with soup that has pasta is having the pasta get overcooked as it sits. This makes a ton, so it is impossible to add the pasta while it is cooking but not have leftovers with soggy, overcooked pasta. Wish there was something to do to help this, besides cooking the noodles separate and adding them to each serving. The pasta is so much better cooked in the soup, but only if eaten right away. What a wonderful recipe! Thank you! It makes a generous pot! Plenty to share. My family ate it for two days. The one small change I made was to cook the chicken in stock rather than water. It seemed a shame to loose all that wonderful chicken flavor. After I set my chicken aside , I then triple strained the cooking broth through a fine sieve and used that for the soup also. This was really delicious! Loved the meatballs. Very easy but time consuming. Will definitely be making this again. I made this tonight for dinner, everyone really enjoyed it! They want leftovers for lunch tomorrow. This is my favorite soup ever. Was excited to try your recipe. It turned out ok. Next time I think I will make the broth from scratch, like I do with all my soups. And just use the chicken from that. The broth gave it a very weird taste. But we ate it anyway. Thanks for the recipe!! My husband and myself really liked this a lot. I wish my meatballs were smaller. Maybe a small melon baller? Thanks so much for the great recipe. Made it since it looked like the soup I am used to ….turned out terrific!! It is over 90 degrees today and I still want to make this soup. Looks fabulous. 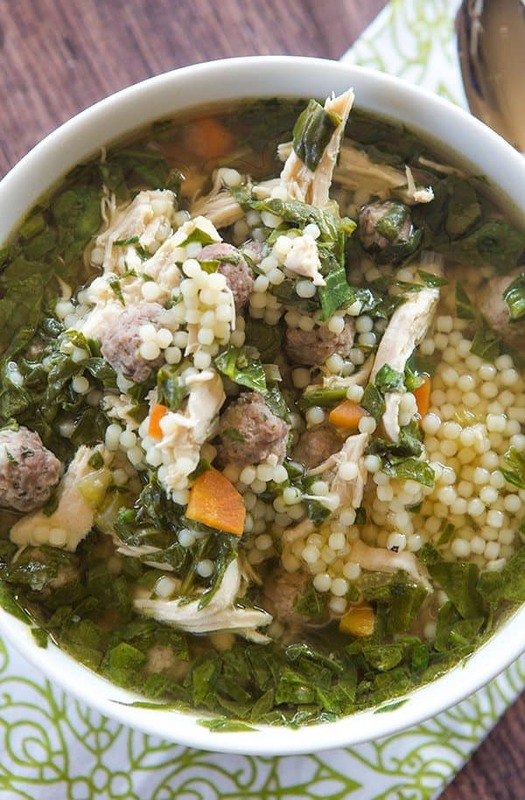 I love Italian Wedding Soup. I’ve never had it with chicken and don’t really think it needs it. But if you must, why not use chicken thighs? They have tons more flavor. You can use whatever part of the chicken you’d like, my mom always used breast! Can you use store bought chicken broth? Ever use the water that the chicken breast cooked in as part of the broth? Hi Karen, Yes I use store-bought broth. I find it more flavorful than the water the chicken was cooked in. This was ridiculously delicious. Thank you for this amazing recipe. You’re welcome, Chelsea! I’m so glad you enjoyed it! This is a WONDERFUL recipe- so many compliments. I did add few more meatballs and little more pasta because we like a hearty soup. Very scrumptious- generally easy. I tripled the recipe and had lots to share and some to freeze for later. Has become my FAVORITE soup recipe to date. Looking for McAlister’s southwestern chili that they are selling right now. This soup puts an amazing twist on an old classic. I prefer the meatballs to be lightly sautéed to a light brown color. Do you think that would be ok to do? Hi Jami, I don’t have the nutritional values, but there are many websites where you can calculate it for free. I know of MyFitnessPal off the top of my head. Enjoy! Tasty! I used my own stock made from boiling the leftovers of a roasted chicken (strained after boiling) and used the leftover chicken in place of the chicken in the recipe. (Note to fellow epicurean explorers, please make sure to pull the chicken fat off the top of your home made stock. )I was thrilled to find your recipe perfectly complemented a specialty pasta I found a while back: “Lavorazione Artigianale rustichella d’abruzzo – Pasta abruzzese di semola di grano duro.” I doubled the amount of pasta to 1.5 cups and there still remained enough broth to maintain the ‘soup.’ We’ll see how it holds up in fridge and freezer. Fingers crossed.Will definitely be adding this to our regular menu!Thank you for sharing it! i printed your soup recipe, 30 pages printed, all i needed was 3. that is a waste of paper and printer. Hi Barbara, You should definitely use the “print recipe” button, as it provides a printer-friendly version of the recipe that will you usually print on one page (sometimes, for a recipe with long instructions, two pages). Loved it! So good. Drizzled olive oil over the top and sprinkled parmesan cheese and red pepper flakes to top it off. A favorite soup. Outstanding Everytime I make it Keep the recipes coming! !! I have now made this recipe twice. It is SO good. 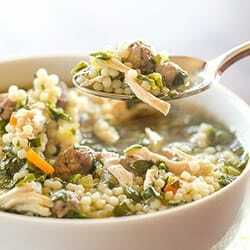 I’ve made wedding soup before from other recipes, but this has everything in it that it should. Pasta, good chicken broth, chicken, spinach and I used veal for the meatballs. There is prep to do but it is not a hard recipe to make. Make it!!!!!!!!!!!!!! Enjoy !!!! !